Happy Turkey Month! To celebrate every foodie’s favorite time of year, Passanante’s Home Food Service will be posting 4 all new Thanksgiving recipes on our blog this month and tons of other great tips and tricks on our Facebook page! First up; no Thanksgiving is complete without a delicious homemade dressing … also known as “stuffing.” Our recipe has been a family favorite for generations and all of the cooks over the years swear the most important things to remember are 1. get a juicy turkey and 2. this recipe takes practice, but the key is to not skimp on the broth! 1. Boil the celery and onion together in just enough water to cover. 2. In a very large bowl combine all ingredients including the celery and onion along with the water they cooked in and 3 or more cups of turkey broth from your cooking turkey. 3. Add sage and poultry seasoning (we always add at least 2 tablespoons of each). Note: At this stage your dressing should be somewhat soupy, but not too thin. 4. Pour mixture into a baking dish or two. Bake at 400 degrees for about 25 minutes — don’t let it get dry! 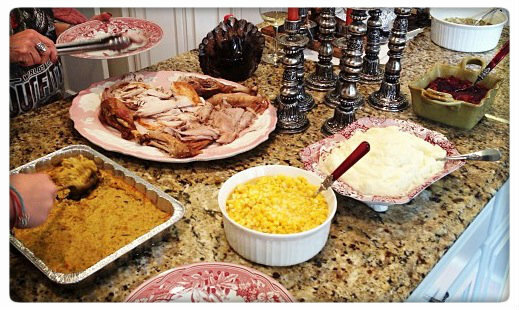 This entry was posted in Recipes, Sides & Salads and tagged Dressing, Food Delivery Service, Passanante's Home Food Service, Recipe, Stuffing, Thanksgiving Recipe by Passanante's Home Food Service. Bookmark the permalink.